A stunning new range of Nerines, available exclusively from us! Brand New and Exclusive to us, these never-seen-before Nerine hybrids in an exciting range of new colours just for us. As many are not available to buy anywhere else, including some unique bicolours, chances are you'll end up with something in your garden that no-one else has got. 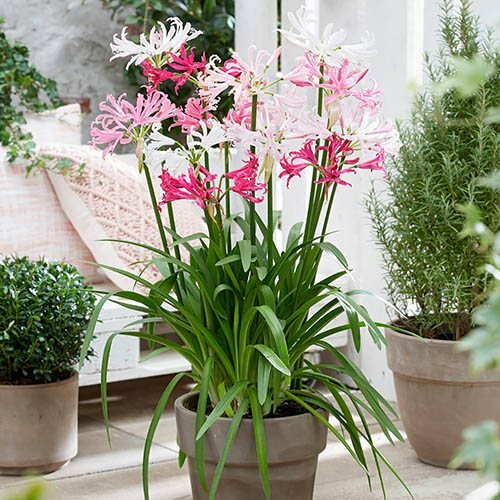 Also known as Guernsey Lilies, Nerines will light up your autumn garden from September onwards in subtle shades of white, pastel pinks and reds. This special range of Nerines has been bred with care and thought to give you something special both yourself and to give as a gift. This 10-bulb collection of mixed Nerines are completely hardy and easily withstand UK winters, growing to around 60cm (2ft) high x 20cm (8in) wide. Brand New and exclusive to us, these never-seen-before varieties have been grown with passion and love by renowned Nerine expert Kitty de Jong. In an exciting range of new colours created just for us, many are not available to buy anywhere else, including some unique bicolours! With these rare hybrids being added to our range of Nerines, chances are you'll have something in your garden that no-one else has got. A distinctive bulb with a characteristic feminine beauty, no other flower is quite like a Nerine. Also known as Guernsey Lilies, this breathtakingly beautiful collection of stunning new Nerines will light up your autumn garden from September onwards in subtle shades of white, pastel pinks and reds. An invaluable plant for the garden border, potted displays and flower arrangements, Nerines add splashes of colour wherever they appear, and their long stems make them invaluable too as a cut flower, when not a lot is blooming in the garden. Unusually, some of the colours in this pretty, exotic collection have a subtle silver shimmer which really highlights their delicate petals and you can see instantly that this special range of Nerines has been bred with care and thought to give you something special both yourself and to give as a gift. Perfect for growing in a drift in flower beds and borders, you could also grow them in big patio pots, say 25-30cm diameter with 5 bulbs in. They're also completely hardy and will easily withstand UK winters. In the garden, plant them about 5cm (2in) deep, and around 10cm (4in) apart. Growing to around 60cm (2ft) high x 20cm (8in) wide, these beauties will flower from September to October after their leaves have died back. We supply a collection of 10 mixed colour bulbs* chosen by our experts to give you lasting displays that will naturalise and get bigger and better every year. Chosen by our experts to give you lasting displays that will naturalise and get bigger and better every year, this 10-bulb collection of Nerines are completely hardy and easily withstand UK winters, growing to around 60cm (2ft) high x 20cm (8in) wide. Nerines prefer very poor soil, and plants grown in fertile soil will grow bigger with more leaves, but at the expense of flowers. Once established, do not split or move clumps as they prefer to be left alone. Bulbs should be planted in autumn or early winter, about 5cm (2in) deep and spaced 10cm (4in) apart. Give them a good mulch to protect from frost in the first year until they are fully established. Plant in a well-drained coarse, sandy soil, in full sun to promote maximum iridescent blooms.